How often you apply mask at home? Try to do it least 3 times a week, I know some girls apply mask every day. As for me I do it more than 3 times a week. Well, after a long and hot day outside I need a good rest and my skin need to restore back its nutrients. feel very relaxing and pampered when I had my mask on and lying on my sofa or bed with soft music on the background. It’s so soothing… and recently I tried the Regen Cosmetic 2 Step Synergy Effect Mask – Nutrition. After hearing and reading so many rave about this mask that comes with face slimming or V shape face effect; finally decided to try it. There are 5 types of Regen Cosmetic 2 Step Synergy Effect Mask to choose from – whitening, nutrition, pore care, anti-aging and moisturizing. My skin look tired recently, I guess it’s due to the humidity and lack of sleep therefore I tried the nutrition masks. The Regen Cosmetic 2 Step Synergy Effect Mask comes with 2 separate masks which is the upper and the lower mask, both has different functions. Step 1 the upper mask is for the different types, so mine is Nutrition Care. It is 100% cotton and loaded with essences to enhance skin hydration, soothing and replenished back the nutrients. Just place on the upper mask on from the forehead and gently smooth it down to the lower cheeks. Step 2 The lower part of the mask is to put on the chin and smooth it upwards then hook-on both side of the ears. This is the gelatinous ear style mask and the material is thicker and stretchable to fit and firmed up the face and jaw line to create that V shape face effect. Overall, Regen Cosmetic 2 Step Synergy Effect Mask – Nutrition is suitable for all skin types including sensitive skin user. This mask comes in patented dual synergistic benefits on the skin. It contains no alcohol, no coloring, no mineral oil and no preservatives. I like the soothing and relaxing mild floral scent plus the rich mask essences. Thanks to the lower part of the mask that contains salicornia extract (grass green) that helps enhance skin elasticity, V shape and also firmed up my jaw line. Immediately after 20 minutes my skin felt so supple, firm and look brighter. 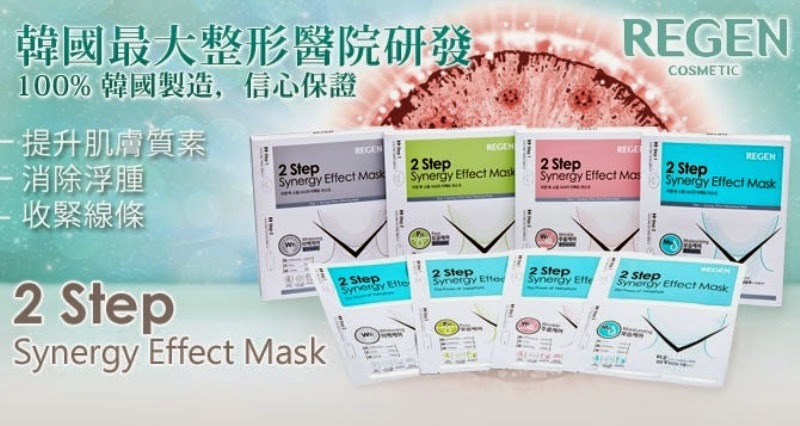 Availability: Regen Cosmetic 2 Step Synergy Effect Mask is available at Hermo Malaysia, a reputable online beauty store that has all the beauty products and overseas hard to get cosmetics at a good price. Hermo Malaysia also provides FREE SHIPPING with any 2 item and above. Their products are 100% authentic and imported straight from official distributer worldwide. Do check Hermo Malaysia regularly because they always have new products, surprises and deal going on every day. After browsing through their website, I found some interesting skincare and cosmetics brands that I have been eyeing and wish try such as the SKIN & LAB Dr. Vita Clinic fre-C Sun Protector SPF50+/PA+++ with concentrated Vitamin C & E; and the 3CE colour cosmetics. How about you have you try SKIN & LAB and 3CE products before? Definitely would give this a try! heard of this mask. really cool! I read about this form of mask on Lady First. But not sure if it's the same brand! How many types of mask are there? only one? Much positive effects on facial care and I think for male too...ha..ha..ha..I observed some male species nowadays used masks for their daily care. Looks a bit complicated to put on a paper type mask compared to a rubbed-on cream type of mask. How does it compare to you? Does this paper type make you feel cleaner? I want one! I'm gonna check out the shops here to see if they have Regen Cosmetic. I'm into these paper masks myself - I usually get my stash from The Face Shop. Good review, share the info to my nieces who are fond of mask. Very affordable din pala the price. omg i apply just two times a week! :) i want one like this too.. Woo I love masks!! They are very relaxing and nice. What's more regen cosmetics is quite famous too. so interesting to have a 2 piece mask set like that! but it's actually pretty pricey. i still have a huge stack of masks lying in my drawers, i'm just too lazy to use them... not even once a week. oops! The mask looks very refreshing/relaxing on the face (as shown in your photo). I love the idea that you just put the mask on your face. I've tried masks, those that you need to spread on your face and it's such a messy thing to use. Haven't seen this kind here in my country, though. I am always on the prowl for a good mask or exfoliater. Thanks for sharing this. It will help me in my search for the best! This could really make the face look more vibrant and alive. It's cool that they provide free shipping too. I have saw a lot of bloggers reviewing this mask. I shall try this too. That is quite the mask. It looks like a heavy duty dirt remover. I don't normally use masks, but this seems like a really neat one I should check out! Hope to find this in Manila! I love mask nutrition and always apply similar products on my face as a way to pamper my skin. Regen cosmetic 2 step synergy looks like such an awesome product to try!